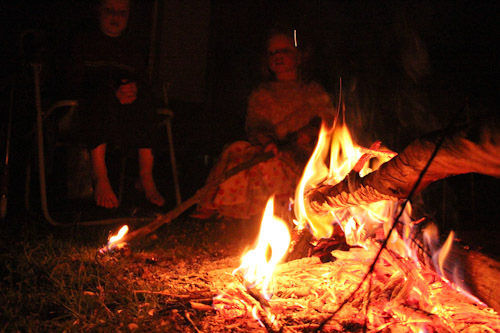 While we loved our camping times in New Zealand, we did miss the enjoyment of open fires. Despite its high rainfall, most places in NZ instructed us to “light no fires”. Coming back to fire-savvy Australia, we’re welcome to light campfires responsibly! Tonight we collected wood as a family and brought it to our trailer. Then Brioni tried lighting the matches to start the flames. A little firelighter left over from our hot-air balloon stunts at the beginning of the year helped get things going, and we settled around to watch the flames — a new experience for Dell, who will learn how to be safe around fires like our other daughters. The main fire-play activity tonight was heating small stones with the fire on the end of sticks so the girls could observe any changes in the colour. 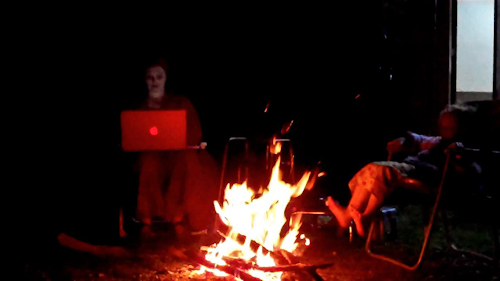 Later, Brioni warms her toes near the flames as I catch up on my blogging. A fire wards off the chill before we go to bed. Even though we should be mid-way through spring, the nights are still getting quite cool here, dropping to 4°C (40°F) overnight. This is what we experienced in New Zealand, so we’re already accustomed to the low temperatures and simply rug up for the night. Each day is nice and warm, so we can’t complain — we’re simply focusing on enjoying the journey!